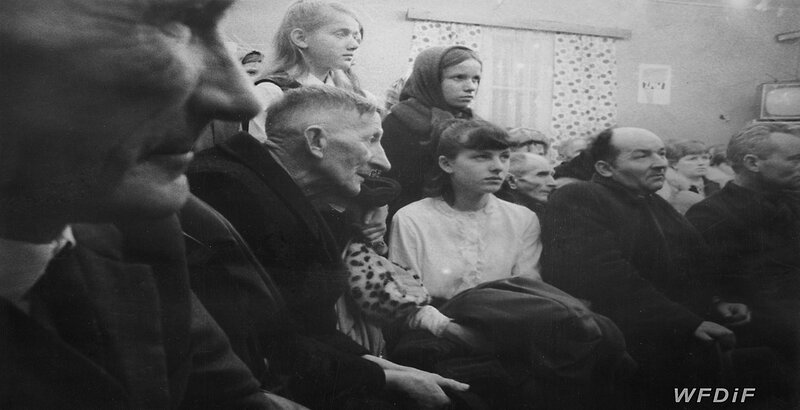 Heralded as the most political of all Gryczełowska’s films, this short offers an account of one MP’s visit to a small village. It starts with a car pulling in front of a building. Three men get out and walk to the accompaniment of a brass band that brings to mind the pompous sounds commonly heard during Communist parades. The next cut shows a village woman greeting the officials with bread at the beginning of their meeting with the villagers. The rest of the film consists of edited observational shots. Once the people in the crammed auditorium are seated, the MP starts speaking. Using Newspeak jargon, he first reminds the audience of the aim of his visit: he arrived to find out what the peasants need to improve their living conditions. 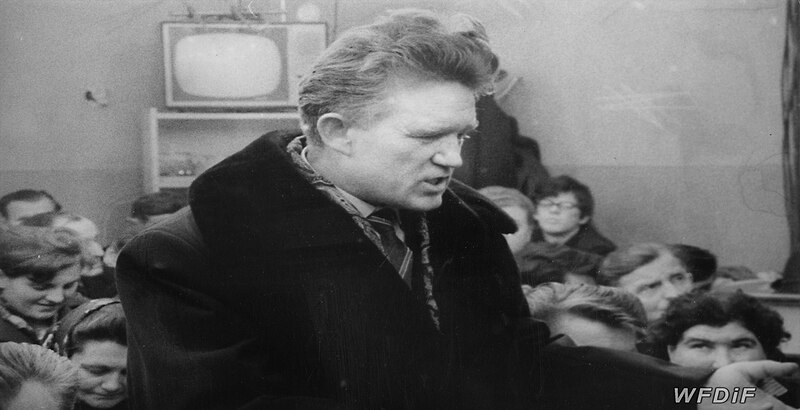 Heralded as the most political of all Gryczełowska’s films, this short offers an account of one MP’s visit to a small village. It starts with a car pulling in front of a building. Three men get out and walk to the accompaniment of a brass band that brings to mind the pompous sounds commonly heard during Communist parades. The next cut shows a village woman greeting the officials with bread at the beginning of their meeting with the villagers. The rest of the film consists of edited observational shots. Once the people in the crammed auditorium are seated, the MP starts speaking. Using Newspeak jargon, he first reminds the audience of the aim of his visit: he arrived to find out what the peasants need to improve their living conditions. The camera scans the claustrophobic room, closing in on doubtful expressions of men and women. We listen to several peasants, who one by one point to the futility of their local politicians’ promises. Many say that nothing ever gets done despite rounds of reassurance from the top. The road to the village has not been constructed, water supply has not been fixed and public money got wasted in unprofitable investments by some swindlers in the council, to give just a few examples. 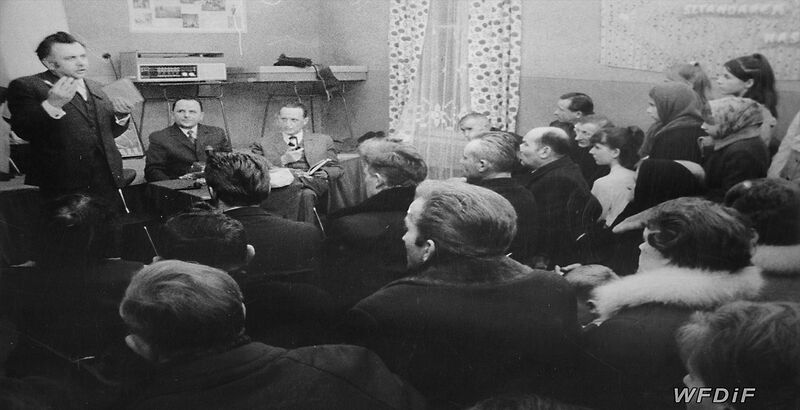 As more men stand up to express their disappointment with the local Communist officials, they start asking: ‘Who is responsible?’ Their questions fall on dead ears. In response, the MP only offers a few remarks about patriotism and citizens sacrifice, not addressing any of the raised issues. Seeing that there is no way to communicate with the politician, at the end of the meeting the local men pull out their musical instruments and the brass band starts playing a cheerful waltz. This absurd conclusion to the meeting becomes a metaphor for a political regime in which the common people are sold illusions of political power, though they can only survive by loudly blowing their trumpets to obscure the Newspeak. Soon after the nation watched the first wave of workers’ protests against the Communist government in December 1970, Gryczełowska’s observation of this micro-world was read as evidence of local resistance to the political elites. …In February 1971 is available on DVD with English subtitles.